The ever-reliable ifixit.com has again provided us with a beautiful tear-down of the new multitouch Magic Mouse from Apple, revealing that it's '22.5 times smarter than the average mouse'. 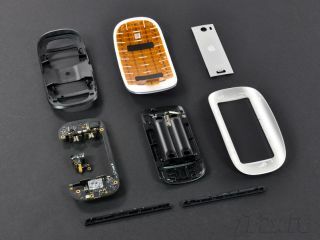 Ifixit's tear-downs have quickly become a firm favourite in the office, and its latest takes us inside the brand new Apple gadget - the Magic Mouse. So what did it find out? Well, for starters, the entire surface of the mouse is covered with capacitive touch sensors, and the mouse contains just 10 grams of aluminium. Nearly half of the mouse's weight comes from the two AA batteries, with 37 grams of plastic and a Broadcom BCM2042 Advanced Wireless Keyboard/Mouse Bluetooth Chip also present. And with the average mouse 'brain' weighing 0.4 grams and the brains of the Magic Mouse weighing 9 grams ifixit points out 'the Magic Mouse is 22.5 times smarter than your average mouse. Who knew?'. You can find the complete teardown on ifixit.com.